Recently, during a Design Thinking workshop, attendants started to talk about the issues facing their organizations. It did not take long for the stage-gate process to be the main topic under discussion. Some mentioned that they were considering killing the stage-gate process since they found it too bulky, too complicated and a big time-waster for their company. 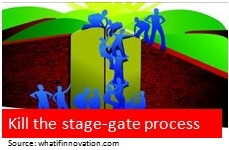 The stage-gate process became popular in the mid 80’s when the book Winning at New Products was first published. Many companies embarked on the stage-gating process in the hopes of creating the next breakthrough product or technology. However, a number of articles and empirical evidence show that the stage-gate process does not prevent failed launch, nor guarantee success, and in fact creates a lot of waste in the product development process. The stage-gate process is built around EXECUTION. But the innovation process should first be built around EXPLORATION and only focus on EXECUTION in the last 2-3 phases. In other words, innovation is not linear but the stage-gate is. That’s why most the of the so-called “innovation projects” start with a solution, when in fact they should start with a need to be filled, a pain point and “seizing the white space” as described by Mark W. Johnson in his book Seizing the White Space: Business Model Innovation for Growth and Renewal. To innovate, companies must fulfill unmet customer needs in their current markets, serve entirely new customers or create new markets and be able (i.e. agile enough) to respond to tectonic shifts in market demand, government policy, and technologies that affect entire industries. True innovation needs some room to explore and let the original ideas morph into a completely new solution as you discover unmet needs and customer constraints. At this point, trial and error is important to increase market knowledge and improve success rate. This is one stage which most engineers have difficulty with! It becomes obvious that the stage-gate is not flexible enough for the new business reality that spreads knowledge more easily than ever. You cannot rely on new technology or the last product you developed. You have to increase the pace – and to do so, you need to attack on many fronts simultaneously. Unfortunately, our engineering background values procedures and controls, which is exactly what the stage-gate process focuses on. I agree that the last few steps of any innovation process should be built around procedures and controls. At that point, you need to focus on getting the product out the door. But the first few stages should focus on customer knowledge and how to leverage your capabilities (technology, manpower etc.) to fill those unmet needs. The first few steps require going back and forth and learning as you go….which is hard to accept for an engineer! So what’s next? Who knows!? But I can tell you that the stage-gate is losing its grip and that you need let go of the procedures and controls if you want to speed up your innovation rate. At Triode we have tools to help your team pick up the innovation pace. Do not hesitate to email me at psirois@triode.ca if you want a copy of our tools. These can be used privately but are not for public sharing.